[Pit-A-Pat Korean] Ep.10: Listen to Super Junior’s song ‘Cooking? Cooking!’ & learn Korean from it~! Group Super Junior to release their 3rd concert album containing exclusive tracks of their live performance. Super Junior live album titled ‘SUPER JUNIOR THE 3rd ASIA TOUR CONCERT ALBUM ‘SUPER SHOW 3’ will be released on October 24th as a gift for fans. 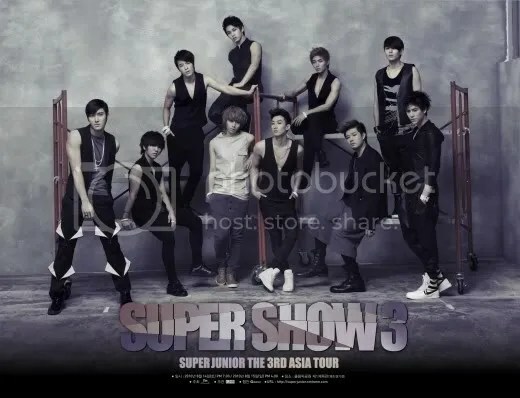 The album consists of 2 CD recorded from ‘Super Junior THE 3rd ASIA TOUR CONCERT ‘SUPER SHOW3’’ last August 14th and 15th at Seoul Olympic Park Gymnastics Stadium, revealing a brilliant performance from the group. In addition, not only that it will feature Super Junior hit songs, including those from the 4th album, but it will also features hit songs from their sub-units K.R.Y, T, M. You can also expect to find Defcon feat Sulli’s song ‘How To Break Up With Idol’ with Heechul as the song writer. With the member’s solo tracks, this album will have 37 songs packed with colorful appeal from Super Junior’s concert. Super Junior trot unit group, Super Junior-T also revealed their new track ‘Tok Tok Tok <똑똑똑>’ on Super Show 3, and Donghae and Eunhyuk will also reveal their duet “I Wanna Love You”. Studio version of four songs will be included as well as new arrangements of ‘Sorry, Sorry’ and ’Don’t Don!’ as bonus tracks. Meanwhile, this November 19th and 20th Super Junior will start their ‘SUPER JUNIOR WORLD TOUR ‘SUPER SHOW4’’ at Seoul Olympic Park Gymnastics Stadium. TAKE OUT WITH FULL CREDITS AND WITHOUT EDITING. DO NOT CREDIT YOURSELF!!! SJ- M Beijing Fanmeeting – Donghae BIAS | Part 48 [8P] – From 110816 . SJ- M Beijing Fanmeeting – Sungmin BIAS | Part 21 [12P] – From 110816 . ‘Sports Kan’ went through a lot for the past six years, and coinsidently a group that was born during the same time is Super Junior. Recently, according to a research/poll done by TVAztec of Mexico, Super Junior was chosen as the most popular korean singers. And recently, they were chosen as the icon with the most potential by BBC of England. The popularity of these people not only from China and Taiwan but all over Asia is unexplanably ‘best’. These are some of the things Super Junior was able to accomplish only 5 years into debut. This group not only broke the pattern of disbanding after 5 years, but have placed themselves as the best idol group of Asia, only 6 years into debut. Recently, the group had their very first concert in Vietnam, which attracted not only many fans but also popular and famous celebrities of Vietnam, was the biggest in the history of Vietnamese concerts. Their album sales are also superior. Their third album, released in 2009, Sorry Sorry was chosen as ‘The most poular song of Asia of 2009’ by Thailand Chanel V. Also it was first on the Taiwanese biggest online music site, KKBOX chart, for 36 weeks, and was first for 34 weeks on the ezpeer+ chart. They took over many charts across Asia. The fourth album “Miinah”, released last year, has been number one for 49 weeks on KKBOX. Member Siwon and Donghae were both casted as the lead roles in an upcoming popular Taiwanese drama “Extravagant Challenge”. Starting with the SMTOWN WORLD TOUR in PARIS, the group’s oversea’s market will expand over to Europe, along with South America. Early this year, Brazil RedeTV hosted a search/poll as which Korean singers would the Brazilian fans want in Brazil, and Super Junor was chosen as the first. Looking at other idol’s popularity in forgeign countries, Super Junior is truly ‘Korean Wave’s Center’. Especially, the reason behind their significance in Taiwan is because they have members who can speak and sing in Chinese fluently. Also, the songs with addictive beats and strong tempos with easy dance add up to their great popularity. Looking at their accomplishments outside of Korea, it seems like they haven’t been doing much in Korea. But that is not so. The third album, released in 2009, sold 250,000 copies, won Gold Disk and became ‘Album Sales King’ and their fourth album has sold the most as well. Even though there were changes to the number of members, as they debuted for 5 years, and the members shrunk from 13 to 10, they are still the biggest group in Korea. During their debut, the number of the members was a shocking thing, but it worked as not a good thing. Because there were so many, it was hard to let the audience know all the members, and there were some instablity to the form. But, they formed unit groups to change that, and changed the face of the singing industry. ‘Separately or Together’ the unit groups were able to form project groups to significantly show each member’s strong points. Together they would show strong ‘army like’ dances and they would separate and sing a ballad. The ballad unit group, consisted of strong vocals of the group, Kyuhyun, Ryeowook, Yesung, held their own concert in Japan, and Super Junior T were the very first idols to sing trot. Super Junior Happy shows a more bright and light songs, and Super Junior M, who accomplished grand slams at Taiwan’s numerous award shows. Super Junior’s unit groups appealed freshness to the audiences and made them curious. Each members have accomplished many things in many fields such as MC, acting, DJ, comedy, modelling and musicals. It is more suitable to call them ‘General Entertaintment Group’. Leader Leeteuk and Heechul are chosen as the future MCs who will continue on the legacies of Kang Hodong and Yoo Jaesuk. And Idol-actor Choi Siwon has earned praises from his latest work ‘Athena’. Super Junior H – Cooking Cooking Practice Video ! Just like the Don’t Don… these are practice videos that have never been seen I think! Super Junior DON’T DON Dance Step Practice Video! Asia’s most popular group Super Junior celebrates 5th anniversary of their debut. They first appeared on November 6th 2005 through SBS Inkigayo. Since then, they have become Asia’s super star through various activities. Super Junior will hold their 5th year anniversary party in Korea College, Seoul on the 6th. Let’s take a look at the activities they had for the past 5 years. Super Junior is made of multi-talented members who work in various areas as actors, MCs, DJs, gagmans, composers and models in addition to working as singers. Since the debut, they had a catch phrase ‘separately and together’ and performed various activities. Many were suspicious of this strategy. But now, it has become a trend. Siwon, Heechul, Kibum and Donghae are working as actors, while Leeteuk, Eunhyuk and Shindong are working as radio DJs and are appearing various variety shows. Kyuhyun, Yesung, Sungmin and Ryeowook are actively participating in musicals and OSTs. From drama, variety, movies, radio to public performances, the opportunities that idols see these days have increased. It has become an age where idols have to explore other areas and not just stay in one to show off their charms. And these idols will need to spend their energy in the various areas they are exploring into. The phrase ‘one source multi use’ is just the right one to use on idols. Even though they debuted as singers, they don’t show just the features of a singer. If the stage is not ‘wide’ enough for one, one move on to look at drama, movie, theatre and musicals etc, to show more of one’s charms and talents one cannot show in just the short duration of 3 minutes on stage. In the midst of achieving that, these idols will need the strength of that of an ‘iron man’. Even though this is a chance for the singers to up their rich and fame, without the energy to do so is also useless. Victory Korea- Super Junior~ MV RELEASED. :D & CAPS! Popular idol group Super Junior to reveal a World Cup Song to cheer the S.Korean team on for the upcoming World Cup. Super Junior members Lee Teuk, ShinDong, EunHyuk, YeSung and SungMin will come together for a World Cup song ‘Victory Korea’ and a teaser video to the song has been revealed. Instead of the usual cheer of ‘대한민국 (DaeHanMinGook)’, they will use the cheer of ‘우리민족(Our Nation/WooRiMinJok)’ in the World Cup cheer song. The song is an electronic dance song with dynamic electric sounds. According to an official of Irocks Entertainment (아이록스 엔터테인먼트), the company which produced this world cup song, the song will be released as an album together with the official screening of movie ‘Dreams Come True’ on 27th May. Meanwhile, the full song will be revealed on 20th May online, and will be available offline from early June.